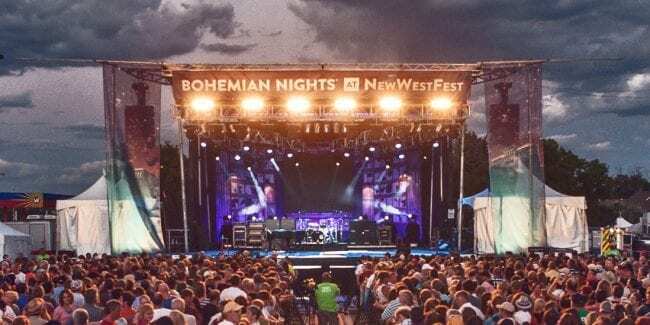 [Concert stage at Bohemian Nights at NewWestFest. Photo: bohemianfoundation.org] This free three-day festival held every August in the quintessential town of Fort Collins will be back this year for another momentous event. The community music festival, which is co-produced by the Downtown Fort Collins Business Association offers a lot for music lovers and families. The Bohemian Nights at NewWestFest will take place in August 9th to 11th, 2019 in Downtown Fort Collins. All attendees will get free admission for all performances in the festival with hopes to promote new talents from Colorado’s music scene. Expect world class performances from artists like The Motet, Blondie, The Decemberist and a whole lot more. There will be six stages set up in different locations, including the Kid’s Music Adventure Stage so you’re surrounded all day long with live entertainment. Apart from the music, there are also other activities to do in the venue such as games and interactive arts for the kids. So, be sure not to miss out on this fun once-a-year event!